And it's a good thing, too, because while the spirals of color are intesting, they are not enough –not even witht the small side cables, to sustain interest. I am really getting bored with these socks. They are about 6.5 inches tall now, from the base of the heel—normally I like about 9 inches (or about an equal length from heel to toe as there is heel to cuff.) and normally I like about 1.5 inches of ribbing for a cuff. Picky aren't I? I demand so much from a sock. It needs to be prettty, to match my clothing, to be interesting to knit, to be functional, to be warm, to be different—and more! It's a lot to ask from something as simple as a sock--but actually it's not the sock I expect to deliver—IT'S me. It all about me and what I expect of myself and my knitting. I am so picky (and yet, I made a mistake with the cable way down in the instep—and left it.) On one sock one cable crosses wrong. And on the other, somehow I dropped a stitch (it's being held for now on a stitch marker)—it will be sewn in when I finish the socks. I don't demand perfection –from my self or my socks. But then why should I? 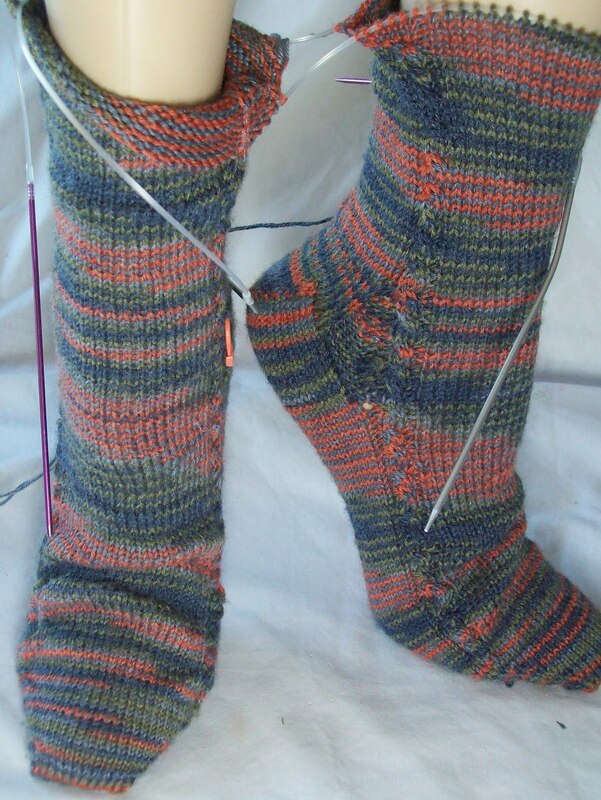 I knit socks for pleasure and practicality—not for one upmanship!